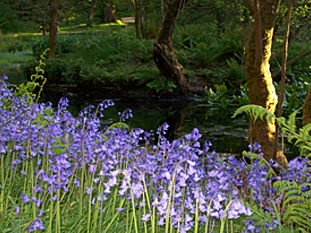 Pencarrow is a 50 acres Grade II star listed gardens. 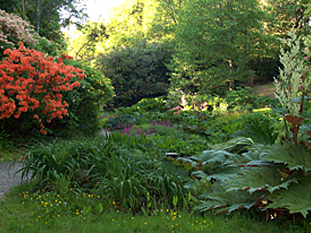 Mature, formal & woodland scheduled historic gardens specialising in specimen conifers, rhododendrons (680 + different species & hybrids) & camellias. Mile long drive, lake, formal Italian gardens & huge granite rockery. The Gardens at Pencarrow were designed and laid out by the radical politician, Sir William Molesworth, between 1831 and 1855. Before his death, Sir William was able to say that he had planted a specimen of every conifer, except ten, known to man and considered sufficiently hardy to stand a chance of surviving the British climate. Lt. Col. Sir Arscott Molesworth-St. Aubyn extensively restored and replanted the gardens, which had become derelict during and after the Second World War. Sir Arscott planted out more than 160 different species of specimen conifers, more than 700 different Rhododendron hybrids, and more than 60 different Camellias. All of these are to be seen in the gardens today. The beautifully proportioned sunken Italian Garden is a prime feature immediately to the south of the house. The great rockery adjacent was built using large blocks of granite carried from Bodmin Moor. 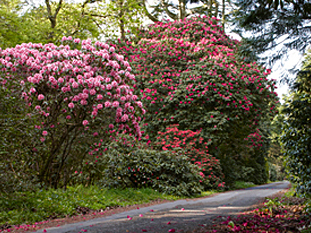 The famous mile long Carriage Drive, lined with numerous specimen conifers, Rhododendrons and Camellias, was first laid out and planted in 1842.